Welcome back to Judge of the Week! 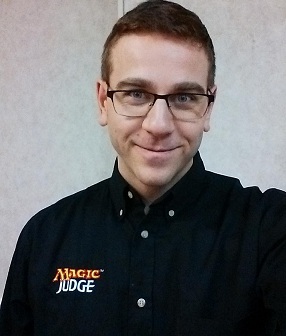 This week’s Judge of the Week is known for his work with the Pre-Prerelease and his love of Canadian Highlander. Congratulations, Serge Yager! Judge Start Date: Ooooh wow… Around Avacyn Restored? So mid 2012? Why did you become a Judge? To give back to the community. Least favorite card: This is a tricky one. I don’t like playing against tempo archetypes. I ‘lost’ 10 turns ago, I just didn’t know it yet. I guess I don’t really dislike any single card? You were nominated for your work with the Pre-Prerelease. Can you tell us about that? The Pre-Prerelease is an interesting judging challenge. On the one hand it’s the first time the majority of people are seeing the cards, so the judge calls have to be correct. We can’t have people take a mistake from the PPR and bring it to their local stores. On the other hand the show needs to be entertaining. It isn’t the pro-tour. 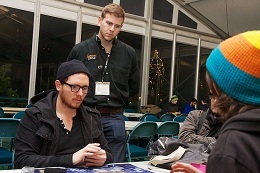 Players are selected because they’re fun and are comfortable on camera, but being on camera makes it really hard to play magic. The added pressure of knowing there’s an audience is always on the player’s mind. This can result in players making misplays they wouldn’t under normal circumstances. How do we keep the flow of the game going so that the show keeps going? This tricky balance resulted in what we’ve called REL-axed. It’s trying to find a balance between letting the cards do what they’re supposed to, while also trying to disrupt the show as little as possible. It’s different from what you’ll see at other events, and we try really hard to communicate that during the calls. Most judges I’ve talked to understand the reason behind how and why it’s run that way, but it’s challenging trying to maintain that balance. Two players playing mono-blue control 100 card singleton decks. Both are using the same coloured sleeves. 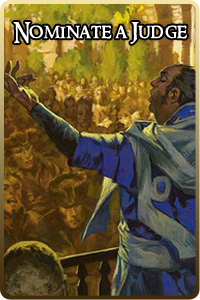 Both players control a Thada Adel AND a Vedalken Shackles. The board state is a mess, but they’re doing alright. They’ve got little pieces of paper and they’re writing who owns which cards. I was playing Canadian Highlander against another judge in the community. There was a Blood Moon in play as well as a Magus of the Moon. Neither of us were casting any spells, because we only had mountains, so we got that part right. However, there was also a Maze of Ith, The Tabernacle at Pendrell Vale, and a Bazaar of Baghdad in play. We were using these non-basic lands every turn. Finding the time to study for my L2. 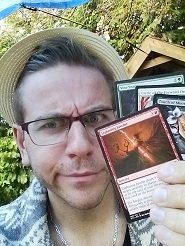 Working a full-time job and playing Magic, as well as other hobbies, doesn’t leave a lot of room for studying. Lucky for me I’m part of an amazing community. I’ve got access to a large number of talented judges. At events I’m always talking to other judges about calls. What happened today, what happened this week, what’s the weirdest call you’ve heard recently? We hosted a judge conference a couple weeks ago. It was fantastic! Just listening to other judges experiences can teach you so much. While I can’t always make time to study on my own, I try and make time to sit and hang out with other judges. Callum Milne was the L2 who mentored me. When I started out, I was pretty useless. I didn’t come from a particularly knowledgeable or competitive background. I just wanted to give back, so I thought I’d become a judge. Callum did a fantastic job in helping me figure out where I needed to improve the most, and helping me get to the point where I could pass to L1 test. Niko Skartvedt is a local-ish L3. One of the most impactful judge moments I’ve ever witnessed was seeing him defuse two angry players with a smile. He walked up to the table, smiled, squatted down so he could be eye level with them, and defused the situation in about three sentences. It made me want to get better in how I communicate with players. It was amazing what a huge impact body language and attitude made in handling that call. I really got into magic around the time original Ravnica came out. I was working full time in Alberta. I was in another town away from my friends, working all the time, and started feeling pretty down. 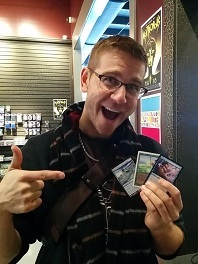 I found a small LGS in the town I was staying in that hosted FNMs. I remembered playing a bit in Elementary school and decided to try it out again. I had a great time and ended up making a bunch of friends in that community. Magic really helped me out when I was feeling pretty down and isolated. At a convention event I was judging we were running a mini-masters side event. There was a young child playing with his Dad. The kid was new to magic, but was doing really well. I helped them out with a couple small calls, and got excited and gave them high fives when they got to add more cards to their deck. The day after the event, their Dad sent me a message over Facebook. He thanked me for everything I did, and said his son had an amazing time especially because there was a judge who helped him out. It made me appreciate how much simple little interactions can shape a player’s experience at an event. Stay with me here, the Crab has a lot going for it. It’s got a plan, it knows what it wants, and it ends games! It can just sit there, and win games. But did you know it can also carry a sword? That’s right, it doesn’t have defender. 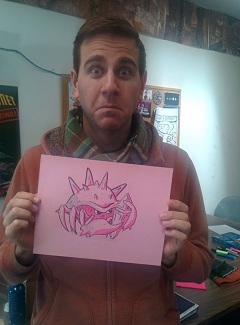 Bam, crab coming at you with a Sword of Fire and Ice in each of its claws. I worked as a coffee roaster. I started a circus and fire spinning club at school. 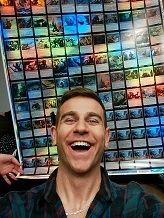 My entire magic collection is double sleeved. Patrick Nelson mains a Titan when he plays Destiny. Serge is a great judge and a wonderful person. He treats everyone with kindness and respect and never ceases to be a beacon of positivity. I can’t think of anyone more deserving of this honour.